How does FiatUSA survive on the 500 alone? I was perusing an article on Autoblog about yet another variant of the Fiat 500 (the Cattiva) and wondered how on earth Fiat can grow in the US. At some point this veritable tigre di carta (paper tiger) will fold unless the company offers a broader selection of desirable vehicles. 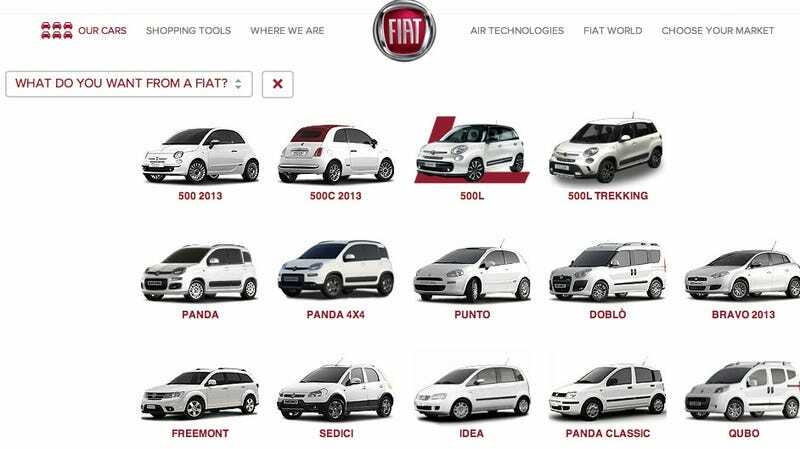 I popped over to the Fiat web site (not Fiat USA, but the actual Fiat site in Italy) to see what they offer. The picture above is a screen grab. Most of the cars are pretty bland or dated to be honest. Perhaps the Bravo might do well over here, but it seems to be dated. Here's a picture from Fiat's Flickr account. It's a concept Bravo called the "Street". Fiat sells the Sedici, which is basically a Suzuki SX4 from what I can tell. That doesn't seem like a great idea since Suzuki shutters its US operations. The Fiat Viaggio is a possibility, but will Fiat want to sell their version of the Dodge Dart here in the US. According to Car and Driver "besides an extra helping of chrome trim, the Viaggio and the Dart are essentially the same car. The story is the same even inside, where the Viaggio also gets a version of the Dart’s 8.4-inch UConnect touch screen." This just doesn't seem like a smart path to take, Americans do recognize badge engineering, though maybe there are those who would prefer a Gucci edition Dart in Fiat clothing. Of course that might not happen if Alfa Romeo finds its way back to the US with more than just the 4C. Is there a re-imagined Fiat X1/9 out there? A Fiat 2014 Spider? I just don't see the light at the end of the tunnel unless Fiat dealers are lashed together with Alfa Romeo and Lanica. Of course we've tried that in America, remember Lincoln-Mercury?